Over the past year we have been out of the office more and working in areas across Northern Ireland. This helps us to ensure that our work is better informed through developing local knowledge and making stronger connections across the region. Our team have divided up into four geographic areas, so we can work with you, our customers, at a more local level and find out more about what matters to people in your community. We will be on hand to chat to you about your ideas and support you with your projects that have been developed and shaped by the people you are working with. Over the next few months we’ll be introducing you to the teams in each area. This month we would like to introduce you to our team working in the Western Area. 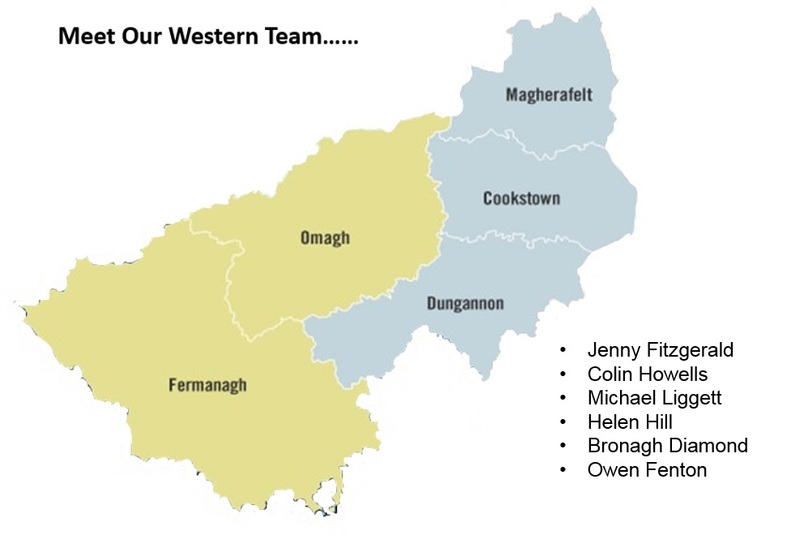 This team covers the Mid Ulster, Fermanagh and Omagh council areas. We have six team members working within the western area supporting our customers; Jenny Fitzgerald, Colin Howells, Helen Hill, Michael Liggett, Owen Fenton and Bronagh Diamond. Our western team are supported by co-workers from our Knowledge and Learning, Communications, Business Support and Funding teams. Our team have been out meeting with groups working in your area; they have been based in community venues providing support to groups who are thinking of applying for funding. We love to chat to you and welcome conversations about the project ideas your community have developed. It is fantastic for us to hear how you are building on the strengths and abilities already in your community and using existing resources to order do this. We can also support you by linking you up with like-minded groups in your area. You can visit our Facebook page to find out when we will be in your area, so you can pop in for a chat. You can also contact us if you would like to chat about funding options or discuss your project idea by calling 028 9055 1455. You can also email our western team directly by clicking on their names above. We can also help with promoting and publicising your project if your application to us is successful so please do get in touch. On 6th December, we will be hosting an event in Clogher Valley Community Centre area. We are inviting groups who work in the Augher, Clogher, Aughnacloy, Ballygawley, Caledon, Castlecaulfield and Fivemiletown areas to place a bid for £500 of National Lottery Funding for their project idea. You can get in touch with our team to get an entry form. Completed entries should be submitted by 19th November. 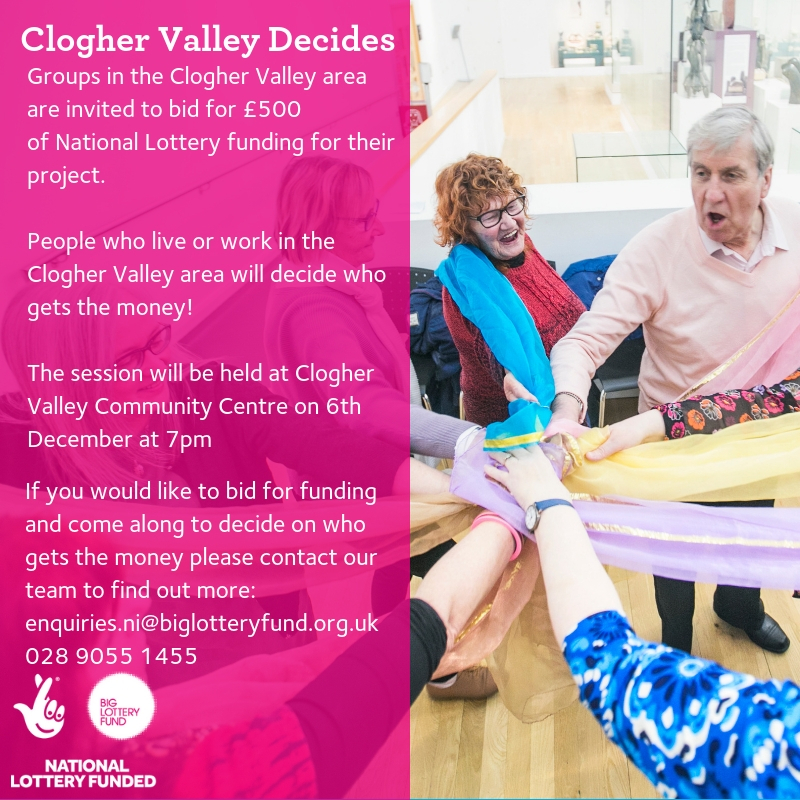 We are also inviting anyone who lives and works in the Clogher Valley area to come along on the 6th December to decide on who gets the funding. Get in touch with our team to find out how you can get involved in deciding where National Lottery money should go in your local area. One hundred and eleven projects in your area are currently supported with £10.5m of National Lottery funding. We currently have three grant programmes open for applications Awards for All, People and Communities and Empowering Young People. Over the past year, Awards for All has supported fifty groups in the Mid Ulster council area to the value of £449,454 50. Thirty-five groups in the Fermanagh and Omagh council area have also benefited from £310,945 through our popular small grants programme. Our People and Communities programme is currently supporting eleven projects based in your area to the tune of £2,150,740. Projects like Community First Aid Responders County Armagh and Tyrone and Mid UIster Volunteer Centre received funding through this programme. Leonard Cheshire Disability’s Access for Success project have received funding through our Empowering Young People programme, which is currently supporting five projects in your area with just under £2.4m in funding thanks to National Lottery players.